Due to both the cast and the movie’s alleged romantic-comedy genre, I wrote off Silver Linings Playbook as yet another sloppily put together, mass-produced date-movie made for the dimwitted masses. Boy, was I wrong. Led by recent breakout stars Bradley Cooper of The Hangover (2009) fame and Jennifer Lawrence of The Hunger Games (2012) stardom, Silver Linings Playbook (SLP) is anything but shallow or dumb, and is perhaps the greatest romantic drama in years. Love, joy, grief, loss, anger, and redemption, all in one movie. Just add water. First things first: I would not classify this film as a comedy. The movie’s humor is more a side-product of the story’s numerous awkward situations and rather blunt analysis concerning depression, bipolar disorder, anxiety, and other emotional problems. Its mild-to-black humor compliments the romance that evolves out of a shared sense of emotional suffering, social rejection, and empathy. The main source of conflict for male lead Bradley Cooper and female lead Jennifer Lawrence is not their realization of their love for one another, but rather the growth of their own self-esteem and mental health. The principle dynamic through which it examines this theme is Lawrence and Cooper’s relationship with each other, but the film covers far more than just their budding relationship. Cooper is not an extraordinary actor on his own, but David O. Russell’s great characterizations give him all the tools he needs to portray a memorable, likable, and sympathetic protagonist for whom we can cheer. Though Lawrence is often miscast in roles where she comes across as an immature kid playing dress-up, she’s in her element here as a spunky, fun, yet damaged and vulnerable woman. Her chemistry with Cooper is some of the best on-screen work between two leads I have ever seen in a romantic drama, in part because their characters have more backstory than just their dating history; that being said, their dating history is well written and plays an important, emotional part of the story. The supporting cast is almost as good: Robert de Niro, Jacki Weaver, Chris Tucker, Anupam Kher (of Bollywood fame), Julia Stiles, and John Ortiz make the community around Cooper and Lawrence feel real and personable. The script does a great job introducing us to each of them, and the fact that they all, to some extent, suffer from emotional instability and insecurity, makes every one of them relatable. The film’s pacing is extraordinary and never fails to entertain. All the flirtations, arguments, emotional breakdowns, and exuberant celebrations come at all the right times; Russell’s direction brings out the full power of each scene. Probably one of the most memorable sequences is the slow-motion capture of the Philadelphia Eagle’s pregame celebrations. The tailgate parties burst with emotion, capturing the full energy of the fans as well as Cooper’s embracing of the moment. The few weaknesses of the film concern forced consequences regarding Robert De Niro’s sports-gambling subplot in the film’s later acts. While this provides opportunity for luscious, smooth tracking shots and an energetic dance-number, the coordination of Cooper and Lawrence’s team-building exercise with De Niro’s OCD-inspired gambling addiction feels forced, with a little too much added Hollywood schmaltz. Still, David O. Russell’s emotional direction and his two leads’ fantastic chemistry make every frame of the film feel alive. While Russell’s later projects would get a little too pompous for their own good, Silver Linings Playbook’s story is heartfelt and genuine, and isn’t afraid to portray an ultimately happy love-story that’s multi-faceted, serious, and cinematic. It’s a romance that earns its happily-ever-after, with one of the best shot kisses and final monologues of any romance in years. Then again, perhaps SLP’s greatest strength is how it surrounds this principle love-story with a terrific supporting cast and insightful commentary on the nature of psychology, as well as the power of all types of relationships to ease human suffering. SLP will substitute for a date-night viewing in a pinch, but it’s just as much about the self-love that’s required to give love to others. 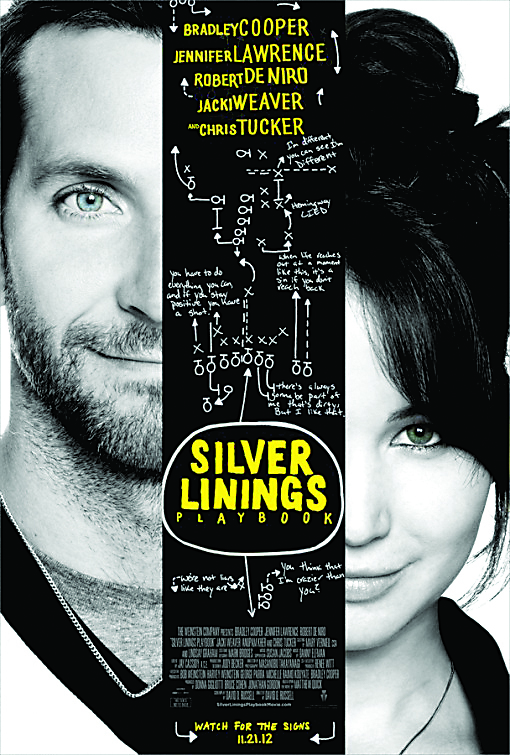 SUMMARY & RECOMMENDATION: Silver Linings Playbook tells a relatable, genuine story that shows both suffering and triumph in the face of emotional disorders. Its greatest strengths are its characters, lead by a memorable duo of Cooper and Lawrence. Russell’s camerawork injects the story with intense emotion and endless energy. This is one love story that is neither sappy nor boring.The supporting cast is great from top to bottom, emphasizing how familial, friendship, as well as romantic relationships can help heal psychological trauma. — However… the gambling subplot is a little contrived.
? The world will break your heart ten ways to Sunday. That’s guaranteed. I can’t begin to explain that. Or the craziness inside myself and everyone else. But guess what? Sunday’s my favorite day again. I think of what everyone did for me, and I feel like a very lucky guy.